I didn’t much play Guild Wars, to be honest. I think I put in, at most, an hour or two in to that game, and I was never impressed. I never got into that game and therefore I didn’t think I would be that excited for Guild Wars 2. How wrong I was, because as I learned more about GW2 I became more and more interested. Now that it is here, I have been playing it nonstop not just to review it, but because it is probably the best MMO I have played in years. I didn’t know how tired I was of doing traditional MMO quests, even after they were a big part of chasing me from TERA. 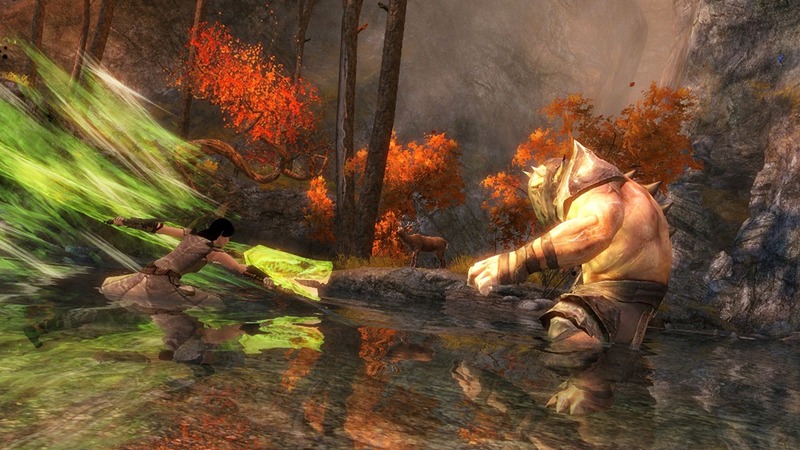 The heart quests in Guild Wars 2 are basically quests, but without the hassle of finding and returning to quest givers. You enter an area and are alerted that you can help a nearby NPC by doing any of a number of tasks. That means that if you can do whichever tasks out of that list that you prefer and they all work towards the same goal of helping that NPC. Once you do, you earn that NPC’s thanks in the form of a letter mailed to you and they turn into a vendor trading in karma, which is one of the currency and a reward you get for doing that heart quest. The experience you get for completing these are nice but nothing compared to what you would get for completing events. You will find random events occurring all over the world while exploring and questing that can be completed by all players in the area. An early event in the human starting area involves protecting water pipes from a bandit raid. Players who are nearby get alerted to this and can run up and take part. There’s no group to join and no quest to pick up, you simply show up and help. You get rewarded at the end of the event based on your participation level so you can’t AFK in an event and just rake in rewards. Some events are multistage as well, such as the aforementioned bandit raid. Once the bandit attack is stopped, you are asked to protect builders repairing any broken water pipes. Events are fun and easy ways to get experience but are random so they’re hard to rely upon for leveling, allot like the rifts from Rift. The classes in this game, referred to here as professions are mainly based on old RPG tropes like warriors, thieves, rangers and mages (called elementalists here). The big change here is that your first five abilities are tied to your weapon. My engineer usually runs with two pistols, which gives me a different set of abilities from when he uses a rifle or a pistol and shield. You’re sixth ability is always your heal (all professions can heal) and then your last four keys are skills based on your class that you can choose and swap in and out. My engineer, for example again, always carries a turret and a flamethrower with him. Picking his flamethrower classifies as giving him a new weapon, which means a new set of five attack abilities. I actually use my flamethrower more often than my pistols. 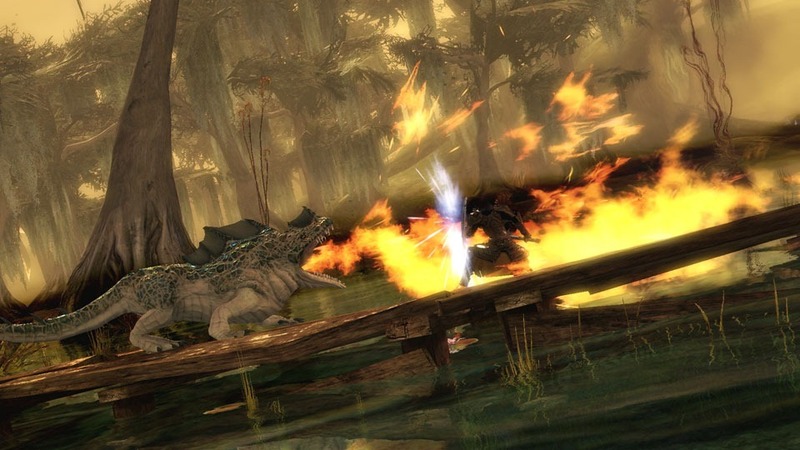 Combat is more dynamic then, say, World of WarCraft while not going to the lengths of TERA. Abilities that you have to channel can be cast on the move which took me some time to grasp but is a key to staying alive. Similarly you can double tap a direction to dodge attacks and roll to gain some distance from your attacker. If your foe is readying to charge at you for example, dodge to the side and save yourself some damage. By default you attack whatever is in front of you, be it an enemy or thin air, whenever you hit an ability button, and if you hit a mob you will auto target them so you can continue to attack them. The best part of combat is that everyone who fights a mob gets credit for its death. That means no kill stealing, no mob tagging, and it encourages you to help your fellow players when they’re in danger. Everyone who attacks a mob gets XP and loot from it. That also applies to item drops, usable quest items and gathering nodes. For example, if I go to mine a copper node and you get there after me, I’ll deplete the node for my character but you’ll still be able to mine it for yourself. That kills ninja-ing and camping of nodes cold. PvP has the more traditional battleground/arenas but the big game is in World vs. World. Whereas you are temporarily leveled to 80 in all PvP modes, the way they do it is different. In the arenas you’re given access to your profession’s entire skill set, while in World vs. World you keep your current skill set and you can actually level up for PvE through it. When it’s active and busy, WvW is a riot and some of the most fun you can have in Guild Wars 2, but all too often I’ve have to trek across the continent for a few minutes of action in the one big fight on the map before dying and having to run back all over again. Having to do that a few times will kill your enthusiasm for the mode in a hurry. The presentation for the game is nice with an impressive musical score. The voice acting is ok, but I haven’t been annoyed by it yet which is a good thing. The graphics are nice and colorful, more fanciful then the more staid and plain look of, say, Rift. There nice touches too, with a oil brush stroke look to unexplored areas of the map and painted scenes behind conversation sequences. I have had a few things that struck me as annoying. For one, the game’s leveling curve is so smooth that the game almost seems too easy at times, to the point that when I accidentally wandered into a higher-level area and got slaughtered, I was momentarily jarred. The Black Lion Trading Post, the game’s compound real-world money shop and in-game money auction house is handy for selling your unused goods but buying is more frustrating because once you buy something you have to track down a Black Lion trader and they’re few and far between. You can fast travel all over the map so this more of a hassle then a flaw but if for example you’re buying goods for crafting, be required to warp half a zone away because none of the settlements near you have a Black Lion trader, and then back to the crafting tables – because the traders and crafting areas never seem to be anywhere near each other – gets old. The game will toss you in an ‘overflow’ server when your home server is full, and you can potentially run into this each time you enter a zone. I think that once you’re out of the overflow server you shouldn’t get put back in to it just because you left town. 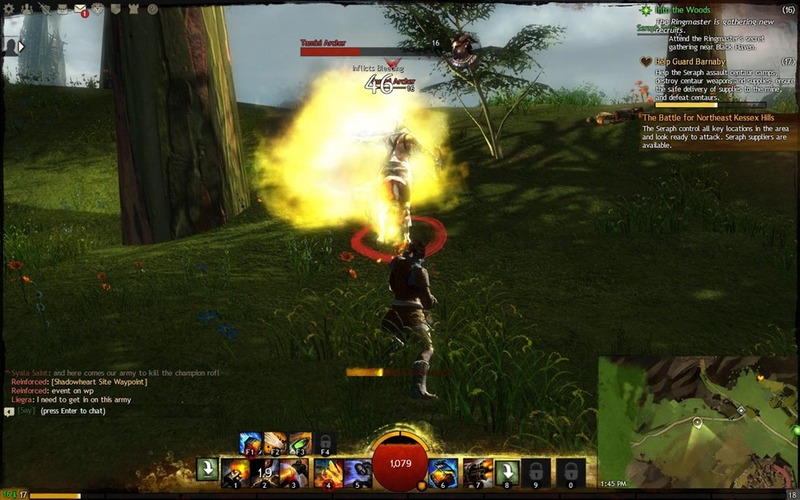 All in all, Guild Wars 2 is a much more user friendly MMO, owing allot of that to its dropping of the traditional questing system and the addition of events. Add to this its lack of subscription fees and you have a great MMO for folks who are burnt out on MMOs. I know I was, and Guild Wars 2 is definitely my favorite online RPG now. I recommend it for everyone.